Timothy Krul signed a contract until 2008 at the Magpies in July 2005. He impressed foreign clubs during the European U17 championship in Italy and the result was a contract at the Premier League club. Normally he is the third goalie of the club and plays for the reserves but sometimes he may sit on the bench because of injuries. He made his debut for the first squad in the 2006 UEFA Cup meeting against Palermo where he played an heroic match. He moved on loan to Scottish Falkirk FC in the season 2007-08. First it was for the first half but the successful period resulted in another stay for the rest of the season. He returned to the Magpies in summer 2008 looking for new opportunities. The NUFC managers agreed a new contract with Krul until 2011. He was send on a month-loan deal at Carlisle United in December 2008. With the transfer of other Magpie goalie Shay Given to Manchester City, the club decided not to send Krul on loan anymore in the 2008-09 season. Since February 2009 he is the second goalie of the club. At the end of July 2010 Krul has signed a new 4-year contract with the club keeping him at St. James Park until the end of the 2013-14 season. The former Holland U21 international made his début on A-level in June 2011 against Brazil. In March 2012 Krul signed an improved contract with the club until June 2017. In August he extended his stay with another year before joining on loan back to the Netherlands. Tim Krul has signed a loan deal for the 2016-17 season at Ajax after the departure of Jasper Cillessen to FC Barcelona. However also because of injuries he failed to make his debut in the first half of the season. He decided to leave the club and signed for another loan deal at neighboring AZ Alkmaar. When Krul returned to the Magpies it was clear that he was not necessary anymore and was given the opportunity to look elsewhere. Brighton & Hove Albion signed the goalkeeper in his final contract year 2017-18 on a loan deal from NUFC. 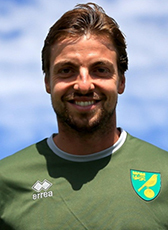 After expiration of his contract Krul went to Norwich City. The Canaries signed the experienced goalkeeper on a 2-year contract until 2020.